What, you say? More neon? Give it a rest already! 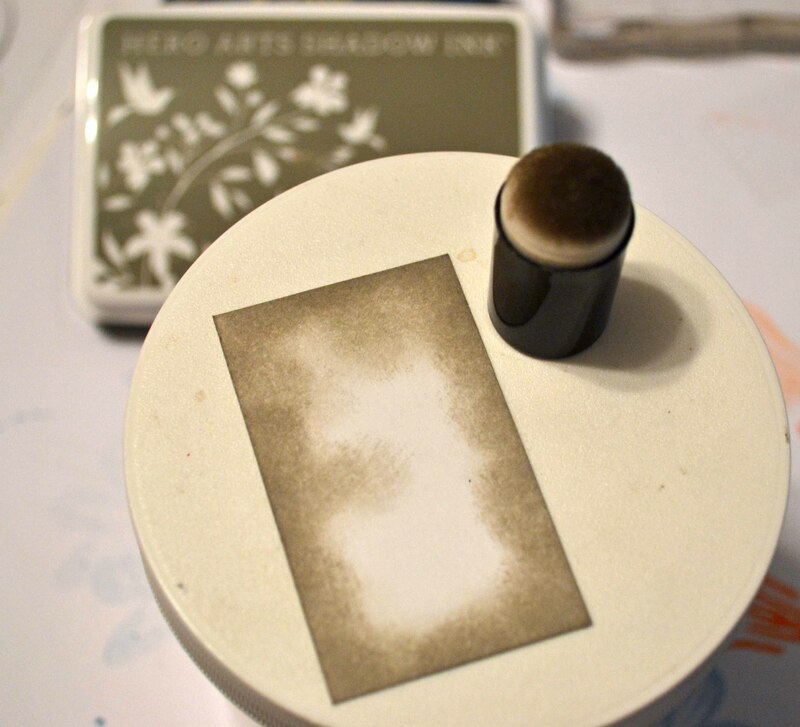 See, here’s the problem… when I get a new toy (new ink, new stamps, etc.) I just have to sit down and play. And once I have everything out — my stamps, inks, pens, whatever — I figure I may as well play until I’m either so tired my eyes won’t focus or I have to go work. 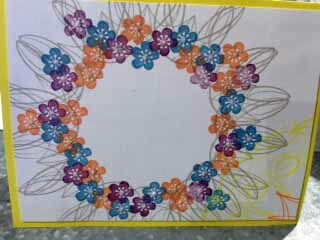 Below are two fun cards using Hero Arts‘ Neon ink pads. 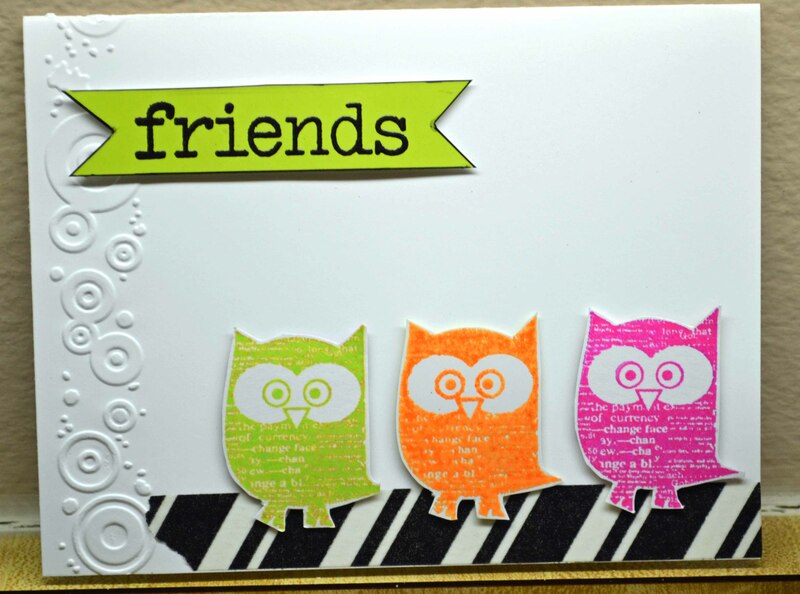 Then I went crazy stamping owls. I must have stamped a dozen or more of these bad boys. 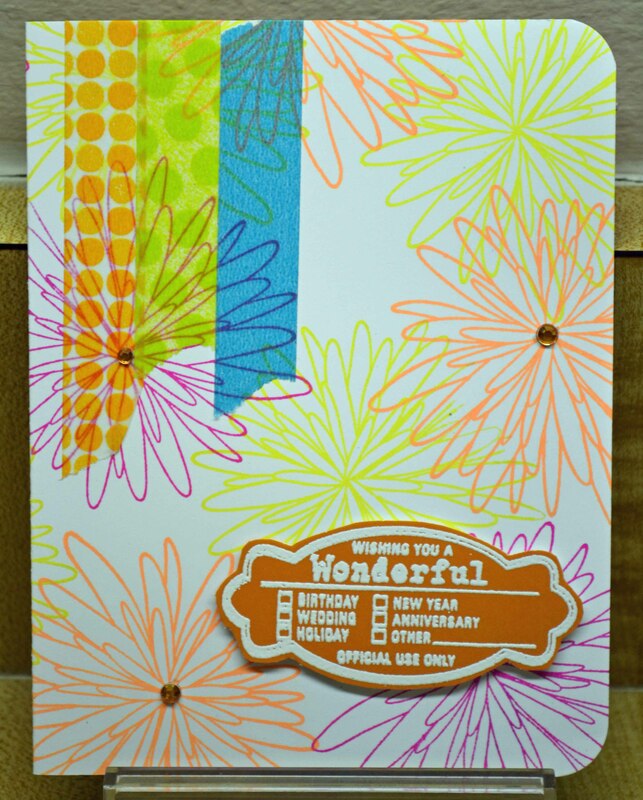 To make the card, I first ran the card through a Cuttlebug border embossing folder; added a piece of washi tape from Elmer’s (yes, they make adhesives other than glue!) See the green owl? Yup, didn’t clean my stamp very well so he has orange undertones. See the orange owl? Wanted to see if these inks embossed, so I stamped the owl in neon orange on glossy cardstock then sprinkled with clear powder. It worked, intensifying the color but blurring the text a bit. The pink owl? Stamped on matte stock and probably the best of the bunch. “Friends” black embossed on scrap cardstock from my stash. Stamps from Hero Arts. Have a neon bright weekend, and thanks for stopping by! Remember when I said I wasn’t all that into neon colors when they first came out? Can you say … now happily addicted? Here are some more neon samples (see my post from last Friday for more). 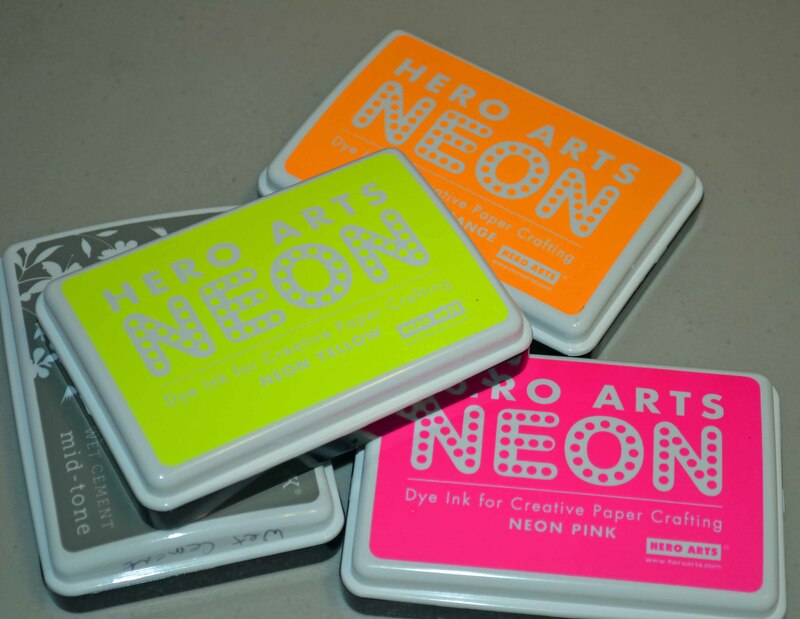 All neon inks are from Hero Arts. All the stamps are from Close to My Heart. I love this set! (You can’t see it very well, but there are shadow images behind the outline, giving a bit of depth to the leaves and the flowers.) The frame was embossed in Zing! Neon Green powder from American Crafts. 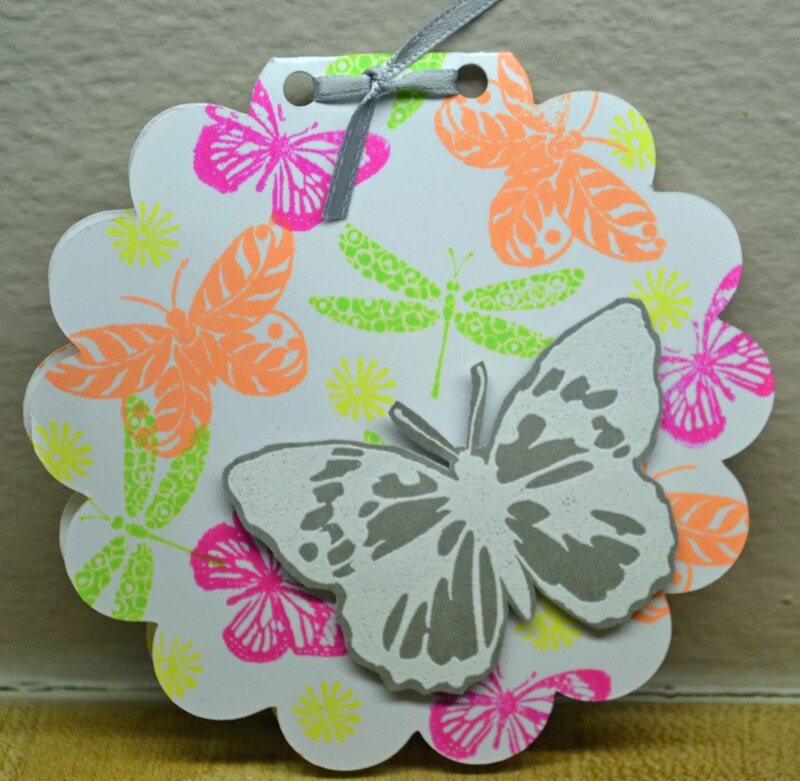 This tag was cut using my Cricut; the neon butterflies are from Prima and Layers of Color; the neon dragonfly and the white embossed butterfly are from Inkadinkado. 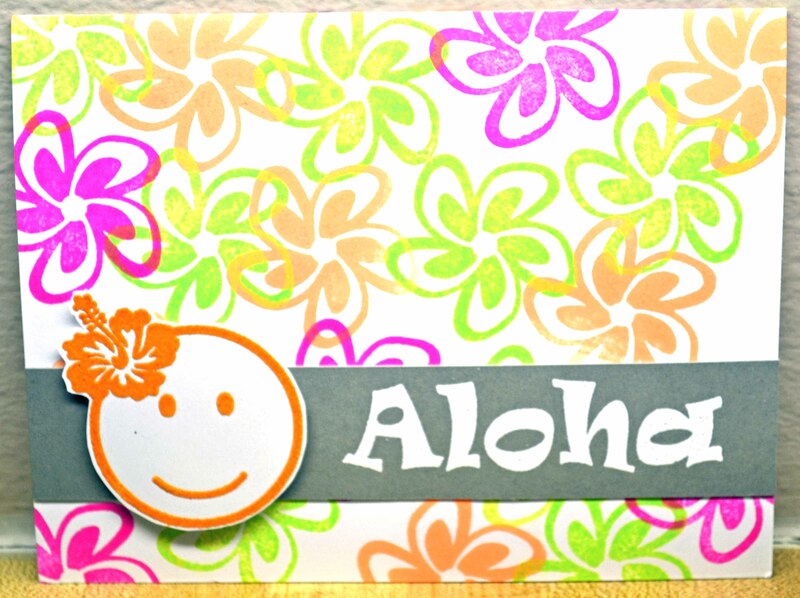 The beautiful image is from Stampendous! and was black embossed. 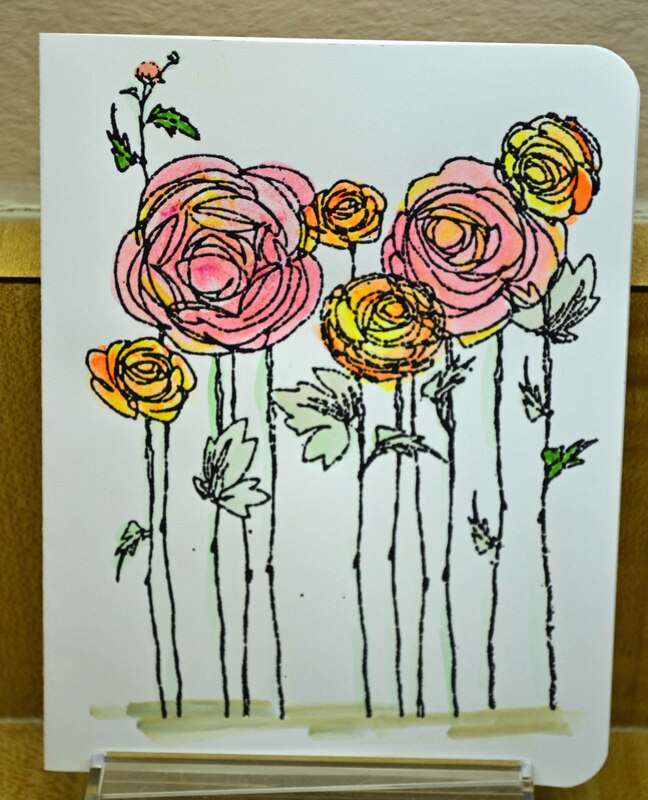 Then I tried to use one of my favorite inking tricks to color in the flowers — smooshing the ink pad directly on my Ranger Craft Sheet, then picking up the color with my water brush pen. For some reason, this didn’t work very well. The ink just stained my brush and wouldn’t brush on nicely. 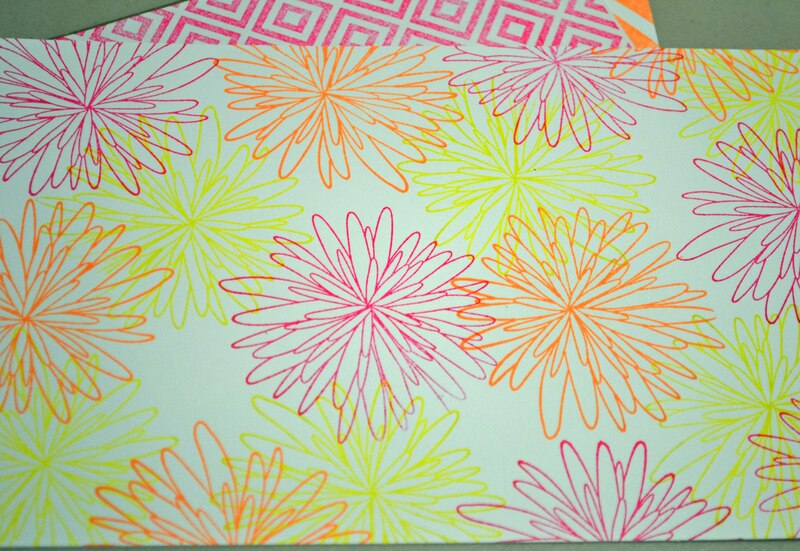 So I wound up using neon highlighter pens to color in the flowers! Thansk for sticking around! And don’t be surprised if there are more…. OK, I give up. I tried to resist the neon trend, but I was mesmerized by the brightness, by the sheer joy of the color. I succumbed… they were too bright and happy to ignore. As you have probably figured out by now, neons are big. I’m dazzled by the Neon inks from Hero Arts, the neon Zing! 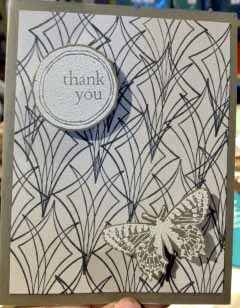 embossing powder from American Crafts and neon washi tape. More during the week. Thanks for coming by! Can you stand one more post about Inkadinkado’s Stamping Gear? I want to show that you don’t have to use the stamps only with the paddle and the cog. Not a great photo… oh, well. 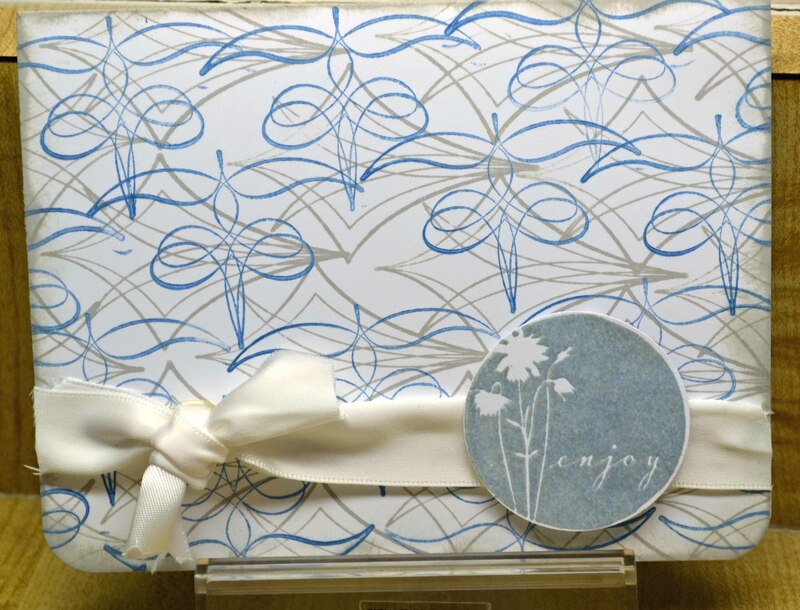 The butterfly and sentiment, both embossed in white, are from Paper Source. A variation. 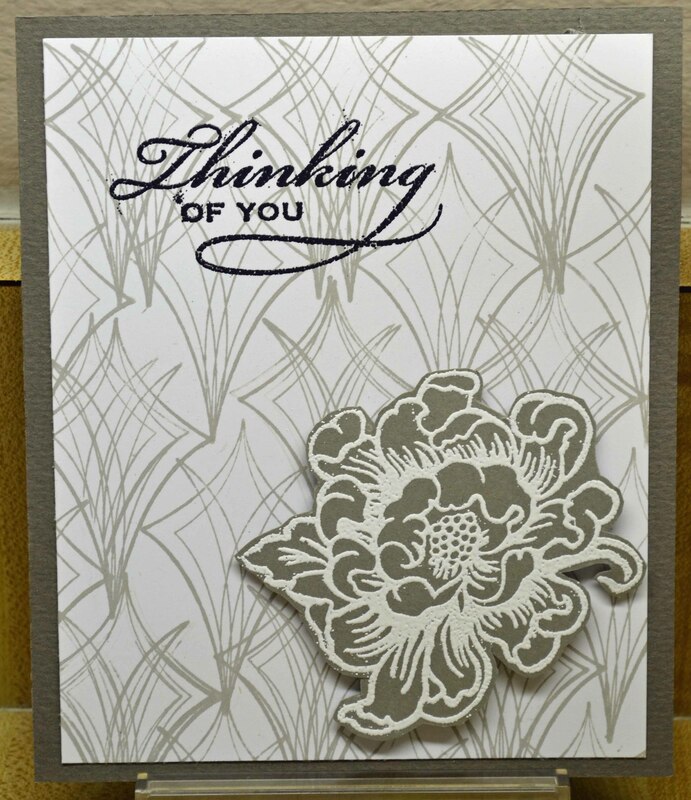 The flower and sentiment are also from Paper Source. I’m not thrilled with the ribbon… it’s too thick. I wanted the shiney satin look, but all I had was a 1″ ribbon. So I folded it in half, gluing the sides together using a tape runner. Then I tied the bow. But the bow looks too thick and clunky to me. Impatient, Imperfect AND lazy!!! And one more… the last, I promise! Thanks for coming back. Next week, something new and bright! 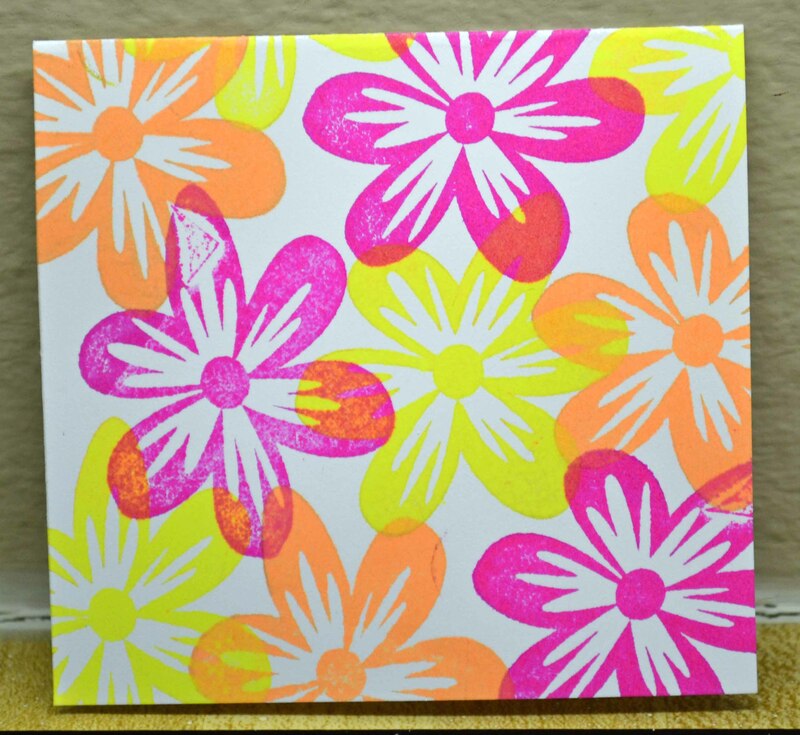 In my last post, I showed some of the fun things to make with the Inkadinkado Stamping Gear. I was able to run amok using the bigger surface of file folders (I’m going to give a set of these as a gift! What fun!). But I wasn’t sure about scaling them down for cards. So I just started playing … which is the best way to learn about tools and techniques! 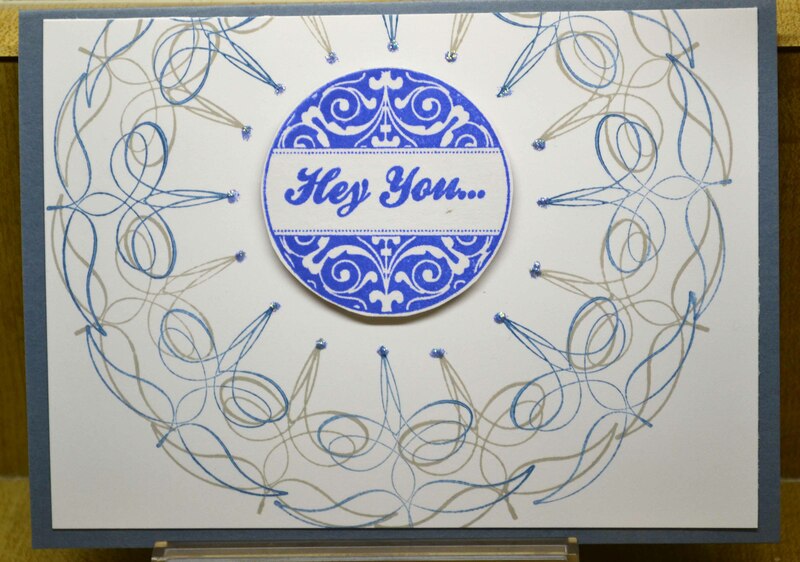 The blue Hey You sentiment (from Technique Tuesday) circle shows up a deeper blue than I had intended! Being the Impatient and Imperfect Stamper, I didn’t want to stop to fix it. 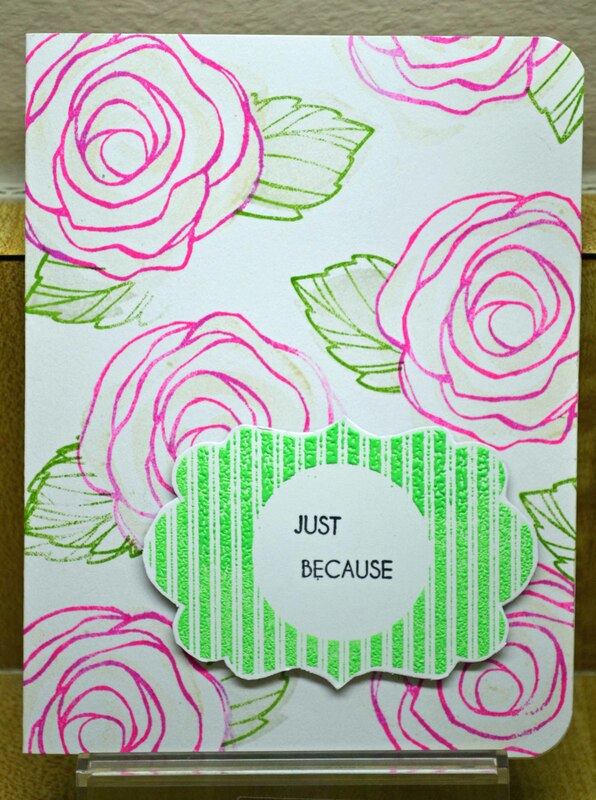 The back cardstock is from Stampin’ Up. 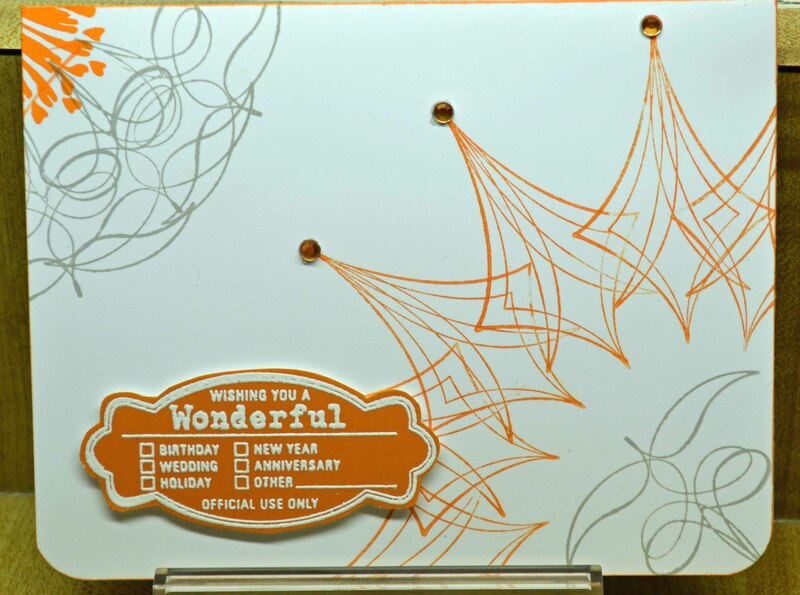 Not sure if you can see the dots of Stickles Waterfall glitter at the points. The sentiment here is from Close To My Heart, embossed in white. The orange gem stones at the points are from Hero Arts. See that bright orange bit in the upper left hand corner? 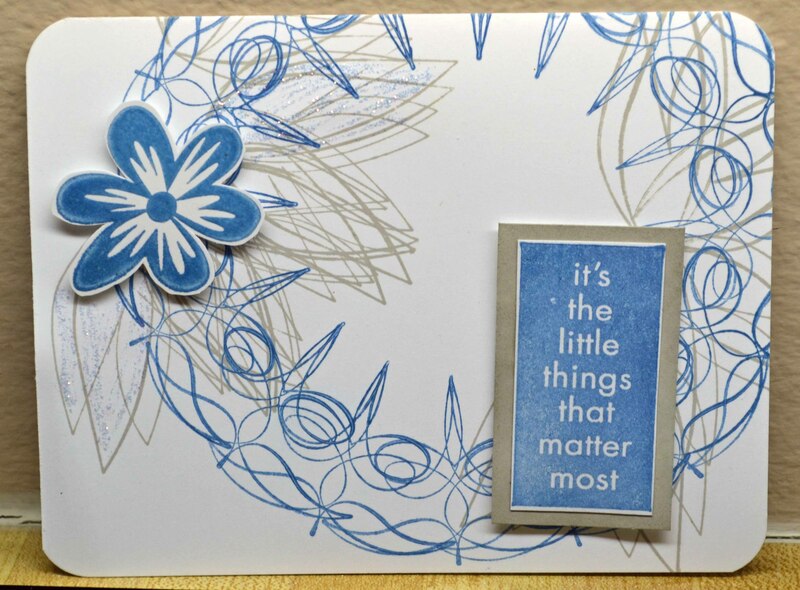 I used one of the images from the Stamping Gear set just as I would a regular stamp. I used it to cover up an oopsie! (Remember, I am often an Imperfect Stamper!) 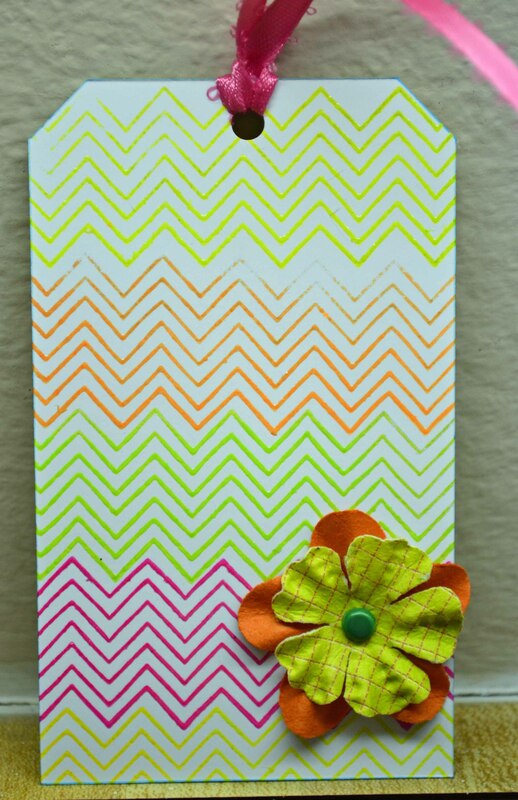 While edging the card with an orange neon marker I slipped and got an orange line in that corner. Would you have noticed or did I disguise it enough? Grin. If you can stand a few more, I’ll add them to my next post. Thanks for stopping by!